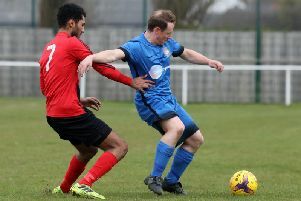 Boss Shaun Sparrow insists the players that took Rothwell Corinthians into the ChromaSport & Trophies United Counties League Premier Division will get the chance to prove themselves in the top flight next season. Sparrow has added defenders Jamie Love and Josh Tupton to the squad that last season finished runners up behind Northampton Spencer. And he reports more players could be added before the season kicks off next month. But the Sergeants Lawn boss, whose team face Weldon in their first pre-season friendly tomorrow (Saturday) said: “For me, keeping last season’s squad together is like making a bunch of new signings. “Six or seven players have turned down financial offers to go elsewhere and that shows where we are as a group. “They’ve got promoted and now they want to have a crack at the Premier Division together. “The new players have to prove themselves. “I’m not going to turn my back on a team that did so well last season. “But we do need to bolster competition for places and we need a stronger reserve side for when we pick up injuries and suspensions. “We know it’s going to be a big ask in the Premier Division next season and I’m sure people are writing us off already. Sparrow says his side’s FA Cup draw has given the club a boost. Corinthians have been handed a home draw with Thrapston Town in the extra preliminary round on Saturday, August 15 – and the winners head to Bedford Town.